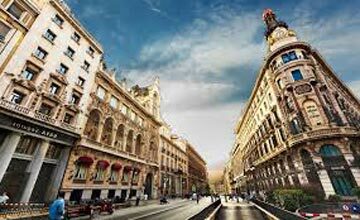 Welcome to Madrid - capital of Spain. On arrival, you will be met by your Tour Manager / Local Representative outside the customs area, who will welcome you and take you to your hotel (Check- in time is after 3.00 pm). Today, drive to Toledo. On a guided walking tour , see the St Tome Church, Santa Maria la Blanca Synagogue, San Juan de los Reyes Church, Museo Victorio Macho and the Cathedral. Also visit a Sword making factory wherein you will be shown how the swords are made. The Factory houses a museum of traditional swords. Later drive to Valencia. Today, proceed for a guided tour of Valencia, see the Town Hall, the Bull Ring, the massive Gateway Towers of Serranos and Quart, and the new Arts and Science Complex designed by the famous Valencian architect Calatrava. Also see the imposing La Seo Cathedral. Evening is free to explore city on own. Overnight in Valencia. Today, drive to Barcelona, one of the best spots in the Mediterranean. Due to its superb location on the Mediterranean, its vibrant street life, fascinating Gaudi architecture, superb cuisine and its world famous football team. Later in the evening enjoy the famous Flamenco Show watching a fantastic flamenco performance with a glass of Wine. Overnight in Barcelona.